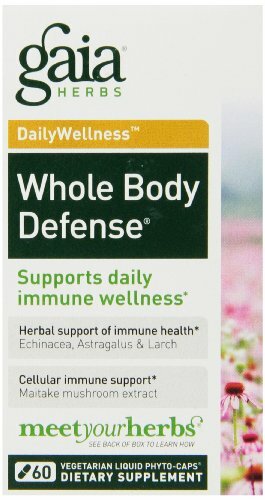 Gaia Herbs Daily Wellness Whole Body Defense supports daily immune wellness. Staying healthy throughout the year can be a challenge, especially when stress wears you down and makes you vulnerable. Whole Body Defense helps strengthen your immune defenses by providing plant-derived immune polysaccharides from Echinacea purpurea grown on Gaia’s own certified organic farm. Whole Body Defense taken daily, it promotes a healthy immune system all season long.